O most beautiful Flower of Mount Carmel, fruitful vine, splendor of Heaven, Blessed Mother of the Son of God, Immaculate Virgin, assist me in this my necessity. O Star of the Sea, help me and show me herein that you are my Mother. O Holy Mary, Mother of God, Queen of Heaven and earth, I humbly beseech you from the bottom of my heart, to succor me in this my necessity. There are none that can withstand your power. O show me herein that you are my Mother. O Mary, conceived without sin, pray for us that have recourse to thee. Her feast day is July 16. Our Lady of Mount Carmel is the title given to the Blessed Virgin Mary in her role as patroness of the Carmelite Order. The first Carmelites were Christian hermits living on Mount Carmel in the Holy Land during the late 12th and early to mid-13th century. They built a chapel in the midst of their hermitages which they dedicated to the Blessed Virgin, whom they conceived of in chivalric terms as the "Lady of the place." Our Lady of Mt. Carmel is the patron saint of Chile. 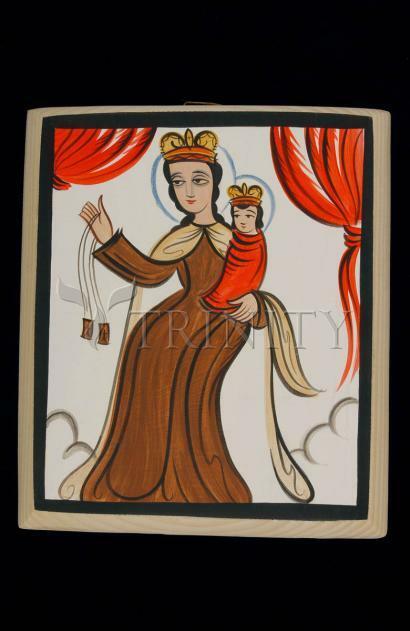 Since the 15th century, popular devotion to Our Lady of Mount Carmel has centered on the Scapular of Our Lady of Mount Carmel also known as the Brown Scapular, a sacramental associated with promises of Mary's special aid for the salvation of the devoted wearer. Traditionally, Mary is said to have given the Scapular to an early Carmelite named Saint Simon Stock. The liturgical feast of Our Lady of Mount Carmel is celebrated on 16 July. The solemn liturgical feast of Our Lady of Mount Carmel was probably first celebrated in England in the later part of the 14th century. Its object was thanksgiving to Mary, the patroness of the Carmelite Order, for the benefits she had accorded to it through its rocky early existence. The institution of the feast may have come in the wake of the vindication of their title "Brothers of the Blessed Virgin Mary" at Cambridge, England in 1374. The date chosen was 17 July; on the European mainland this date conflicted with the feast of St. Alexis, necessitating a shift to 16 July, which remains the Feast of Our Lady of Mount Carmel throughout the Catholic Church. The Latin poem Flos Carmeli (meaning "Flower of Carmel") first appears as the sequence for this Mass. The Feast of Our Lady of Mount Carmel is known to many Catholic faithful as the "scapular feast," associated with the Brown Scapular of Our Lady of Mount Carmel, a devotional sacramental signifying the wearer's consecration to Mary and affiliation with the Carmelite Order. A tradition first attested to in the late 14th century says that Saint Simon Stock, an early prior general of the Carmelite Order, had a vision of the Blessed Virgin Mary in which she gave him the Brown Scapular which formed part of the Carmelite habit, promising that those who died wearing the scapular would be saved. That there should be a connection in people's minds between the scapular, the widely popular devotion originating with the Carmelites, and this central Carmelite feast day, is surely not unnatural or unreasonable. But the liturgical feast of Our Lady of Mount Carmel did not originally have a specific association with the Brown Scapular or the tradition of a vision of the Blessed Virgin Mary. In 1642, a Carmelite named Fr. John Cheron, responding to scholarly criticism that Saint Simon Stock's vision may not have historically occurred (these doubts are echoed by historians today), published a document which he said was a letter written in the 13th century by Saint Simon Stock's secretary, "Peter Swanington". Historians conclude that this letter was forged, likely by Cheron himself. It was nevertheless uncritically embraced by many promoters of the scapular devotion. The forged document's claim of 16 July 1251 as the date of the vision (16 July being the date of the Feast of Our Lady of Mount Carmel) subsequently led to a strong association between this feast day, and the scapular devotion, and in the intervening years until the late 1970s, this association with the scapular was also reflected in the liturgy for that day. The Feast of Our Lady of Mount Carmel as well as that of Saint Simon Stock came under scrutiny after Vatican II due to historical uncertainties, and today neither of these liturgies, even in the Carmelite proper, make reference to the scapular.